Funny story: the Large Pixel Collider demanded such overwhelming graphical power in its towering shell (four Nvidia GTX Titans) and so much piping to keep the liquid coolness flowing, we ran out of space for a sound card. While our eyes were being treated to 11 million pixels spread across three monitors , our ears were feeling left out. Our solution is the Plantronics Rig gaming headset, which rests easy on our heads while it delivers the pops and pings of Arma 3 weapons fire into our ears. 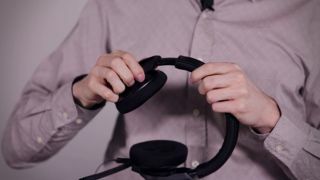 The stereo headset comes with a flexible mixamp that offers independent control of in-game audio and other applications. That means we never have to tab out of a game to adjust our voice chat levels or crank up the Hotline Miami soundtrack, which always puts us in a killing mood. See what's inside the Large Pixel Collider , our own personal demigod of a PC.